Bearings are critical machine components for carrying load and transmitting motion. 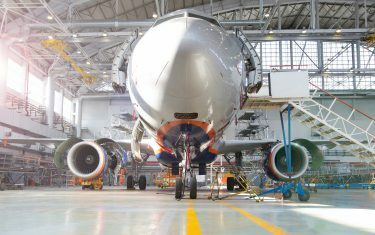 The challenge of ever-increasing power density from modern equipment manufacturing imposes a higher demand for bearing load-carrying capacity and reliability. Today, bearing failure due to rolling contact fatigue is generally a rare occurrence, and the ﬁnal achieved service life of rolling bearings is usually well in excess of the calculated rating life. There are instances, however, where in speciﬁc applications bearings sometimes do fail prematurely at 5 to 10 % of the calculated rating life. Premature bearing failures typically happen at very short intervals after each other – i.e., the Weibull distribution shows a high slope compared with normal rolling contact fatigue (fig. 2). 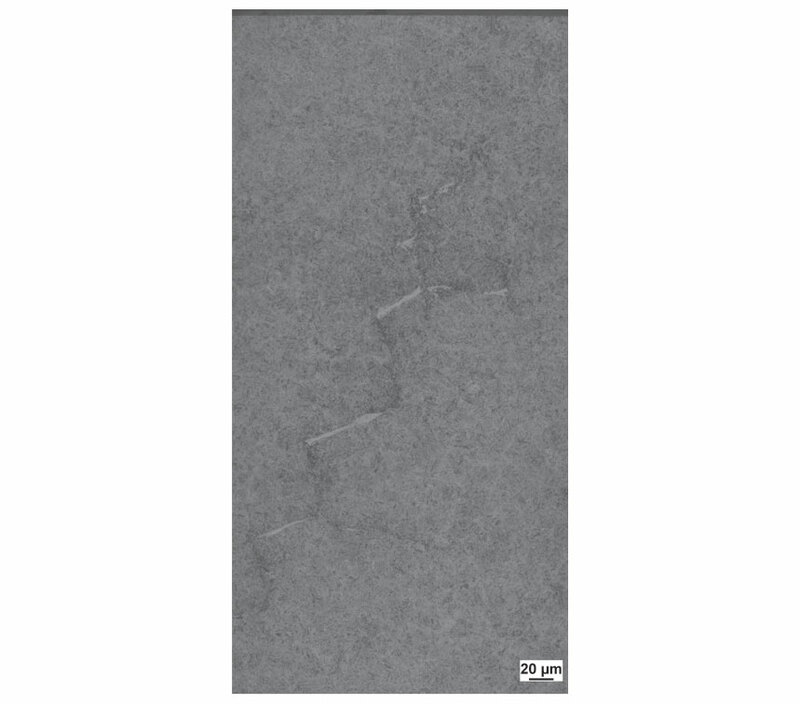 A characteristic feature of many premature failures is the extensive subsurface crack networks that have a “white etching appearance”, referred to commonly as white etching cracks (WECs) (fig. 1). Such cracks typically propagate to the surface, causing spalling of the raceway, which has commonly been observed on ﬁeld returns from applications such as wind turbine gearboxes , automotive drivelines, alternators and peripheral auxiliaries , paper mills and marine propulsion systems . Some typical examples are shown in fig. 3. The root cause of this failure has been discussed extensively for around 15 years, and various hypotheses based on examinations from different perspectives have been put forward. 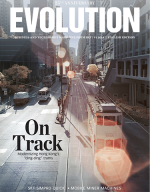 Comprehensive review and analysis of the various hypotheses can be found in . The fact that premature bearing failure has been tackled from different perspectives for the past decades has led to increased understanding of speciﬁc aspects of the problem. However, there is still a lack of consensus about the root cause and failure mechanisms among the main players in the field of bearing failure analysis. Fig. 1: Typical extended white etching crack network; large size spherical roller bearing. 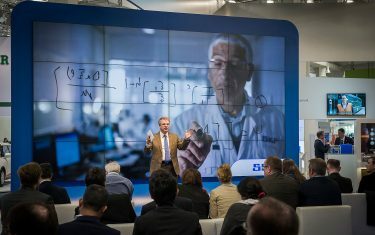 In the past four years SKF has intensified studies, investigations and research on the phenomenon of WECs in order to clarify the role of WECs relative to bearing rolling contact fatigue as well as accelerated fatigue (premature spalling of bearings). 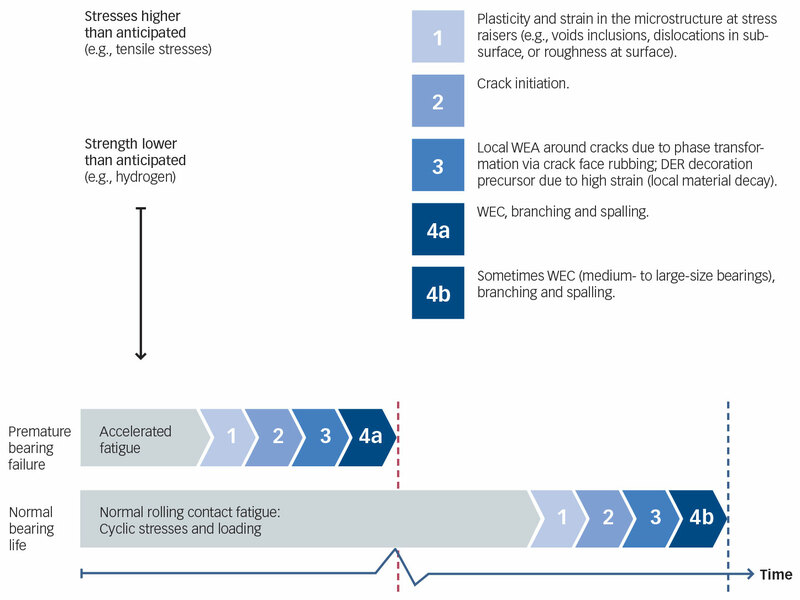 While the issue is still being discussed in the material science community, the findings of SKF strongly support that WECs occur at the end of the failure chain, and are a natural consequence of crack networks in prematurely failed bearings. WECs are considered a symptom rather than the root cause of fatigue failure. 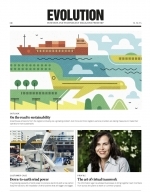 In this paper, a majority consensus view of SKF experts looking at premature failures and WECs is elaborated. A definition of WECs is also proposed, their causes are discussed and a scheme for all failure causes leading to WECs is proposed. Fig. 2: Weibull distribution of bearing failure; red slope: typical premature failure case; blue slope: slope of a normal contact fatigue test. White etching cracks are cracks within the microstructure of bearing steel. They are decorated by white etching areas (WEAs). White etching refers to the white appearance of the altered microstructure of a polished and etched steel sample. The affected areas consist of ultra-fine, nano-crystalline, carbide-free ferrite, or ferrite with a very fine distribution of carbide particles. The WEAs are formed by amorphization due to friction at the crack faces during over-rolling. These areas appear white under an optical microscope, due to their low-etching response to the etchant. White etching areas around cracks are 10 to 50 % harder than the surrounding unaffected microstructure. It is known that small, heavily loaded, long-running bearings can run through several stages of fatigue until failure (very high cycle fatigue) . The first stage is the shake-down stage, leading to microplastic deformation, work hardening and, eventually, build-up of residual stress. During the shakedown, the surface of the bearing may also undergo some microplastic deformation where asperities are flattened. After the shake-down, the major part of the bearing life starts and is characterized by gradual changes in the microstructure . During this stage, the carbide distribution is changing due to microplastic deformation . Also, retained austenite may decay, and all microstructure changes are accompanied by a build-up of residual stress. In an advanced state of bearing rolling contact fatigue, dark etching regions (DERs) can be found as well as white etching, low-angle bands (LABs) and high-angle bands (HABs) (fig. 4 left). Although LABs and HABs are white etching too, they have a different appearance compared with irregular WEC formations found in early bearing failures. This points to the conclusion that irregular WEC formation is not part of rolling contact fatigue (RCF). However, the microstructure of these white etching areas is not very different in crystal structure than the white etching areas that are observed in premature failures. Fig. 3: Some typical examples of premature bearing failure from (a) paper machines, (b) compressors, (c) low-speed and (d) high-speed stages of a wind turbine gearbox. For medium- to large-size bearings, the effects listed above will not necessarily occur in the same manner as in small, heavy-loaded bearings. Like other mechanical components, these bearings typically fail due to breakage of the weakest link (e.g., pre-existing deviations in the material structure such as inclusions and porosities). As explained in ISO/TR 1281-2:2008, the fatigue limit decreases with bearing size above a bearing mean diameter of 100 mm. In addition, when comparing the effects of contact pressure on smaller versus larger bearings, the affected stress volume increases in the larger bearings, as do the negative influences of weak links. One example is inclusions, which are a natural part of all bearing steels . An additional factor that plays a role is the contact pressure itself; in the example given in fig. 4 where low- and high-angle bands were generated, the contact pressure is relatively high (> 3.2 GPa). In many medium- to large-size bearings, the applied contact pressures are well below 3 GPa, which means that the fatigue loading is in another regime, leading to less global damage and more to localized damage around non-metallic inclusions. WECs and dark etching decoration were reported in rolling contact fatigued bearings as early as the 1960s  and within SKF in the 1980s . 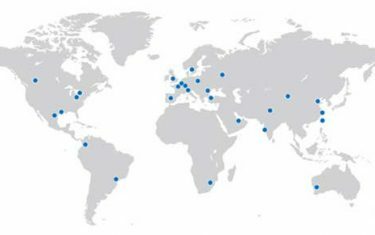 Post-investigations of medium to large-size prematurely failed bearings (either from highly accelerated life tests or from standard endurance testing) have confirmed that the occurrence of extended, irregular WEC networks is a natural by-product in rolling-contact-fatigued bearings (fig. 4 right). Fig. 4: Left: Dark etching regions (DER), low-angle (LAB) and high-angle (HAB) bands in deep groove ball bearings (red line: bearing raceway); right: White etching crack occurrence in a large tapered roller bearing endurance test. 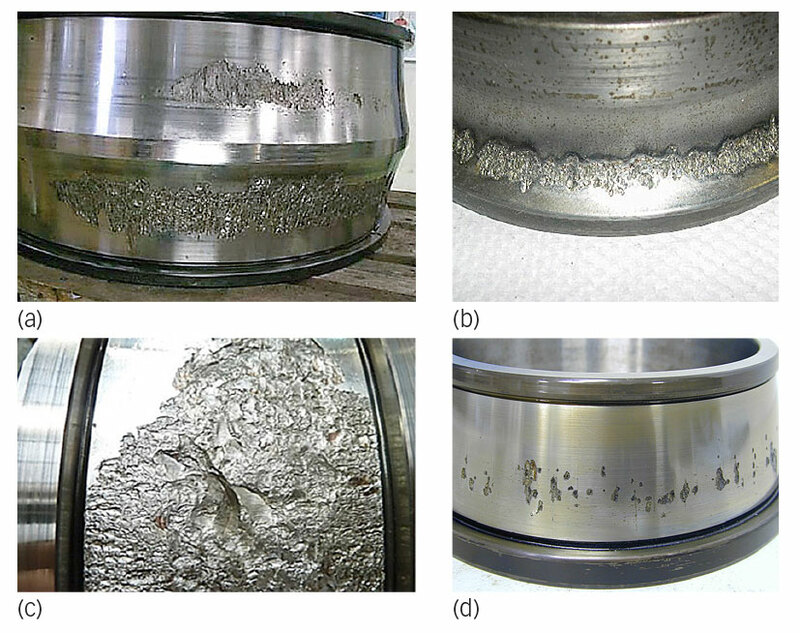 The difference between premature spalling (often interpreted as WEC failures in industry) and normal bearing rolling-contact fatigue can be found in the time it takes for the different events to occur before spalling begins (fig. 5). 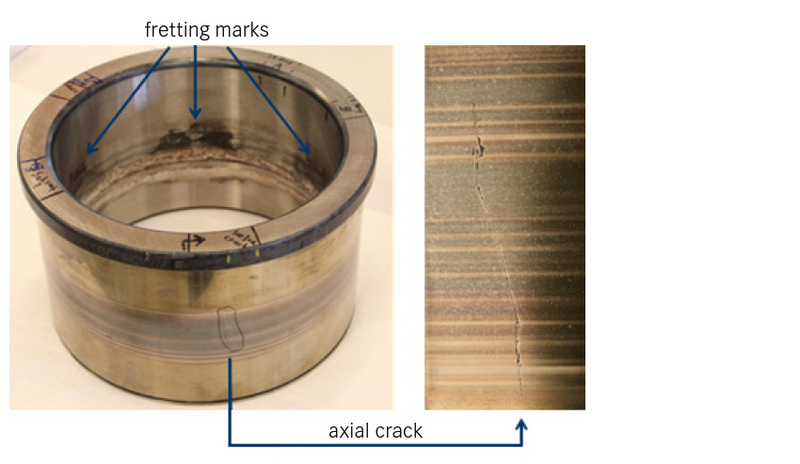 In addition, compared with endurance testing or normal rolling-contact fatigue, premature failures are often associated with crack initiations at several locations/areas as revealed by bearing failure analysis. 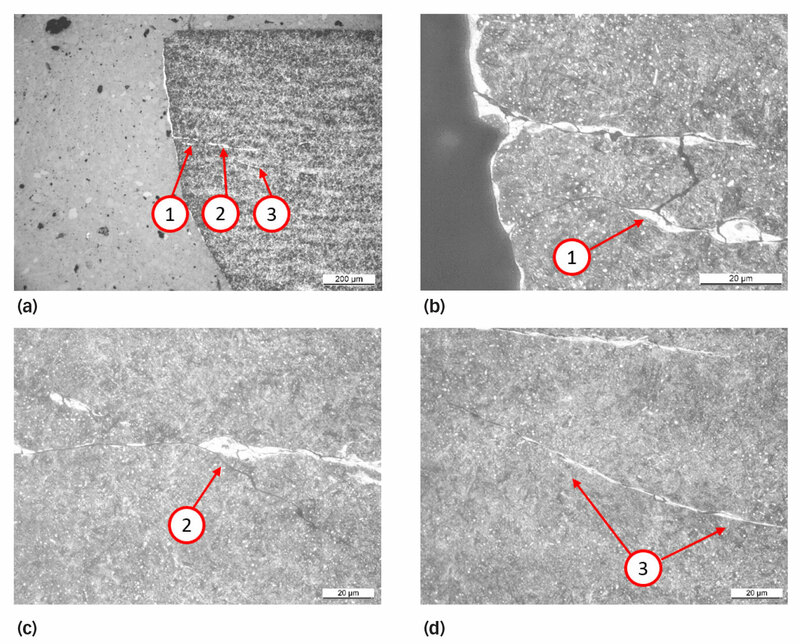 The reasons for crack initiation in bearing steel can be different, and cracks can accelerate in cases of higher stresses or strength reduction due to environmental effects (fig. 6). Brief, heavy load can be caused by unexpected dynamics or temperature effects, yielding heavy preload of structural deformations, edge loading, etc. Structural stress in the bulk material of the bearing (e.g., caused by form deviations, misalignment or other factors) will increase the stress in the material . Increased stress on the raceways can also be caused by severe tribological contact conditions (e.g., too low film thicknesses and/or slip conditions) in combination with certain lubricants . Fig. 5: Simplified chain of events leading to white etching crack development. In these cases, moderate loading conditions may lead to a premature failure. The identified drivers for accelerated fatigue, related to both higher stresses and lower material strength, have been verified by dedicated bearing tests at SKF. Fig. 6: White etching crack occurrence (simplified) in rolling element bearings. 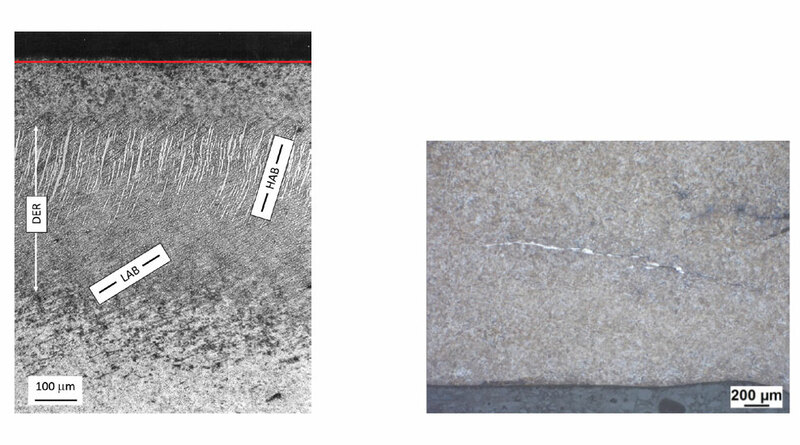 Once crack nucleons are generated (sometimes associated with the occurrence of dark etching regions or DERs), a rubbing process across the crack faces [18–22] leads to the transfer of material from one side of the crack to the other. This results in a meandering crack, which accumulates a white etching microstructure on the receiving side of the crack. The white etching area development also depends on the orientation of the crack in the sub-surface, which can be related to acting internal forces and deformation modes. This is why WEAs are more often found in horizontally oriented cracks (parallel to the raceway), whereas the vertical-oriented parts of the crack frequently show less indication of WEAs (fig. 7). Additionally, the generation of WEAs depends on the interspace between crack faces and the number of stress cycles, as well as the internal stress state in the material. Fig. 7: White etching crack decoration in a sub-surface crack of an SKF in-house-tested bearing (hydrogen-charged bearing test). Figs. 8, 9 and 10 show two examples of stress-related WEC initiation. The results presented in figs. 8 and 9 are related to a bearing test rig that was designed to artificially introduce structural stresses or structural deformations into the bearing seat via waviness. This results in local bearing inner ring tensile stresses. The test involves a cylindrical roller bearing with its inner ring (bore diameter of 220 mm) mounted with a normal fit onto a five-lobe-waviness sleeve that is attached to a shaft with interference. Such a wavy sleeve, produced by hard-turning, will induce five zones of tensile stress of around 205 MPa near the raceway surface of the inner ring. The test bearing is a modified double-row cylindrical roller bearing, equipped with one row of eight rollers, instead of two rows of 24 rollers, on the central part of the inner ring, in order to fit the capacity of the test rig to achieve the required contact stress (fig. 8). The bearing material is SAE 52100 (100Cr6) steel. The microstructure of the bearings is tempered martensite with retained austenite up to 7 % (volume) and hardness of 62 HRC. The bearings have been tested at a maximum Hertzian contact pressure of 1.8 GPa and a kappa value of around 2. The bearings were tested until failure. Fig. 8: Prematurely failed bearing with axial crack on the inner ring raceway. One bearing failed with one visible axial crack on the raceway after 1,150 hours (corresponding to 6.35×108 stress cycles) on the five-lobe-waviness sleeve. The second bearing failed with two visible axial cracks after 1,570 hours (corresponding to 8.67×108 stress cycles). The position of the axial cracks coincides circumferentially with one of the waviness peaks, where a zone of tensile stress is present. It should be noted that four of the same bearings had been tested previously under the same conditions using a standard shaft fit (without artificially introduced waviness), none of which failed until suspension at around > 2,200 hours (corresponding to 1.21×109 stress cycles), and neither surface cracks nor sub-surface white etching cracks were detected during post analysis. Post analysis involves non-destructive tests (NDT) by ultrasonic test (UST) and dye penetrant, measurement of ring roundness, fractographic analysis and metallographic examination under the microscope. Fig. 9: WECs revealed under optical microscope on a parallel section of the axial crack and magnified pictures of three indicated regions. Part of the main crack and branched cracks accompanied by white etching areas. Pictures in (b) (c) and (d) are magnified regions indicated by numbers 1–3, respectively, in (a). A parallel section was made on the sample with an opened crack as indicated in fig. 9. It can be seen that after etching, part of the main crack appears white under optical microscopy, and that at a depth of about 500 µm below the surface, the crack had branched. 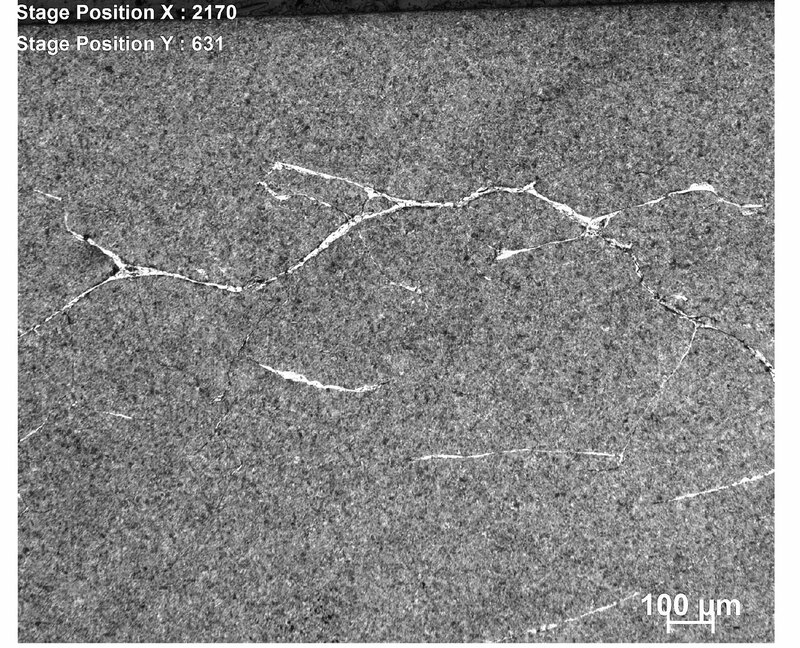 The branched cracks are also WECs that had propagated in a direction parallel to the raceway about 400 µm from the main crack. Magnification of the branched cracks (fig. 9(b), (c) and (d)) supports the thesis that cracks connect to each other, forming networked WECs in the sub-surface. Parallel sections were also made at two other circumferential positions that correspond to the peaks of the wavy sleeve shaft. Though no surface cracks were observed on the surface, multiple WECs were found in the subsurface of these regions, where tensile stresses induced by the waviness were present during the test. For more details, refer to . The results presented in fig. 10 are related to a test with 23024 spherical roller bearings that have been exposed to short-term heavy loads. Fig. 10: Extended sub-surface WEC network in a 23024 bearing outer ring, caused by short-term heavy loads. During the short-term heavy load, the bearing is exposed to a contact pressure above 3 GPa for about 15 minutes at good lubrication conditions (kappa around 3.5). The bearing that was previously exposed to a short-term heavy load, is mounted afterwards into a radial test rig. Here, a moderate contact pressure of around 1.7 GPa and a kappa of around 2 is applied. Under these conditions the bearings are either suspended after around 3.3×107 cycles or have failed before. Fig. 10 shows a circumferential cut and nital etch of an outer ring. The related bearing failed after 1.9×107 cycles due to a spall in the loaded zone of the outer ring. An example of a sub-surface WEC in a hydrogen-charged bearing has already been shown in fig. 7. In  a detailed post-analysis of hydrogen-charged and non-hydrogen-charged angular contact ball bearings as well as deep groove ball bearings can be found. WECs have been found in failed 81212 cylindrical roller thrust bearings when carrying out oil evaluation tests using FE8 rigs . To date, the test conditions, a combination of mixed friction and high kinematic slip (not representative for radial roller bearings), indicate inconclusive results. So far, no final conclusion can be given if WECs in FE8 tests are more a consequence of surface-initiated fatigue (where a lubricant plays an important role too), or the result of hydrogen entry or a combination of both. Fig. 11: Typical 81212 bearing failure appearance of a roller (left) and WEC occurrence (lateral section 84 µm below the raceway) inside a washer (right). Bearing tests using steel-on-steel 81212 cylindrical roller thrust bearings have been carried out. The bearing material is standard bearing steel according to SAE 52100, martensitic hardened, having a retained austenite content of <3 % and a hardness of around 60 HRC. These bearings are tested at moderate loads (max. 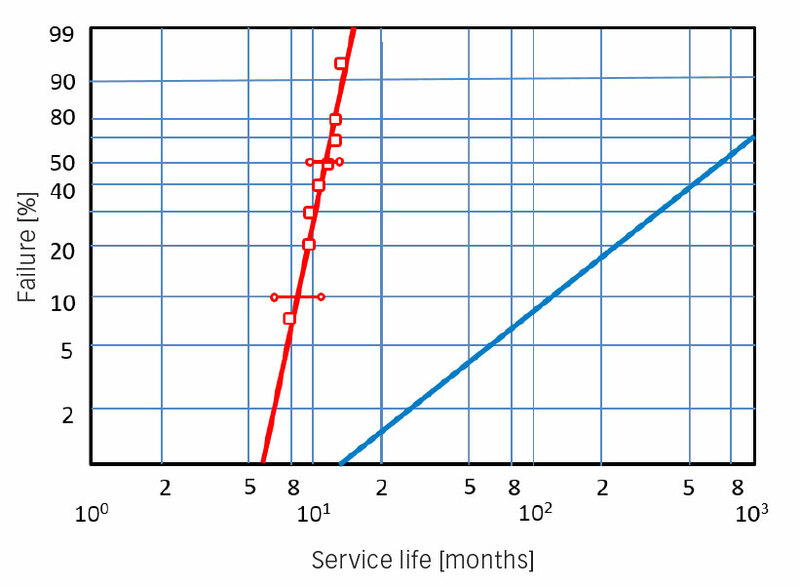 contact pressure around 1.9 GPa) and inadequate lubrication conditions (kappa around 0.3). Different oils and oil mixtures have been tested. A typical failure appearance is shown in fig. 11. Although not shown in detail here, in all tests carried out, rollers failed mostly and washers rarely. The tests have been either run until failure (spalling) or suspended. For bearings that have failed by spalling and WECs have been found, it is assumed that white etching decor-ated sub-surface cracks may have been developed already prior to any spalling. This is because sometimes sub-surface cracks have been found in non-spalled components too. For more details, refer to . Table 1: Recommendations to avoid premature spalling failures. 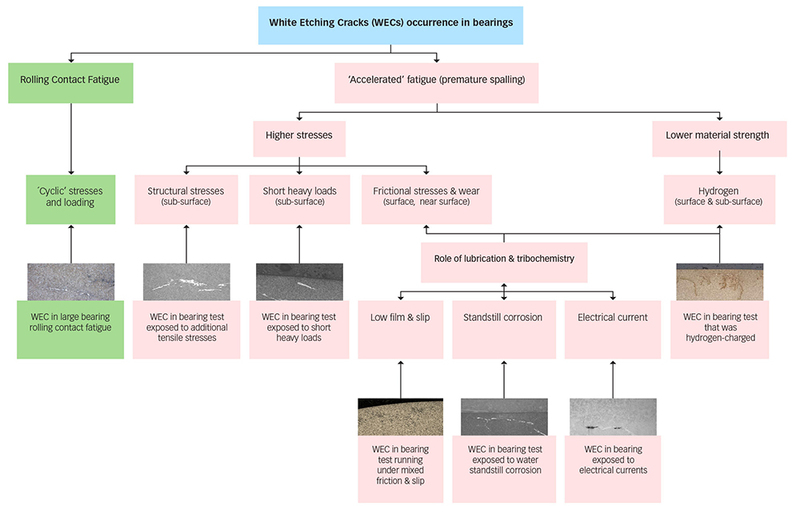 The findings above do explain why WECs can be found in all types of industry, all types of bearing and all types of heat treatment (through-hardened as well as case-hardened material) , because WECs occur at the end of the failure chain and are a natural consequence of crack networks in prematurely failed bearings. The key to identifying the root causes for bearing premature failure is not only to study WECs, but rather to ﬁnd out the relevant weakening effects (related to higher stresses or lower material strength) that lead to accelerated fatigue. Generally speaking, failure of any mechanical component is due to breakage of the weakest link. This is when the local stress exceeds the local strength. Premature failure is a result of signiﬁcant weakening of the weakest link. The reliability of rolling bearings used in various applications obeys the weakest link principle. Weak spots always exist inside the material or on the working contact surface. A bearing fails if the weakest link is broken. When the lubrication condition is poor or the surface is roughened (e.g., after particle indentations), the weakest link could well be on the surface and the bearing fails due to surface damage such as surface distress or wear. Under good lubrication conditions, the weakest link could be in the sub-surface, owing to the presence of material defects such as inclusions and high shear stress resulting from Hertzian contact and failure of the bearing results from crack initiation and propagation from the pre-existing material defects. For rolling bearings, the strength of the weakest link can be related to a load or stress limit known as the fatigue limit. A bearing fails if the fatigue limit is exceeded. Premature bearing failure occurs when the fatigue limit is considerably reduced, or in other words, when the strength of the weakest link is signiﬁcantly reduced. It is the weakening, due to higher stresses or due to reduced material strength, that causes early crack initiation and accelerated crack propagation that leads to premature bearing failure, but not WECs. When there is no weakening, a bearing may fail as a result of normal rolling contact fatigue by a single spall showing little or no WEC occurrence, because cracks propagate quickly when the material reaches the end of its life . In other words, no time for material transformation within the crack system is left. With increasing levels of weakening, the bearing may fail prematurely in the form of extensive WECs, because the material within initiated crack systems has time to transform locally from DEA to WEA. With increasing severity level axial cracks with less extended WEA decoration or even fracture without WEA decoration may occur, because cracks propagate too fast . Each premature bearing failure is unique. Looking again at fig. 6, it can be seen that the reasons for premature spalling can be very different. A single root cause does not exist, and each failure case needs to be reviewed in the light of the corresponding operating conditions. Based on the categorization of the weakening drivers into “higher stresses” and “lower material strength”, very general recommendations can be given as shown in table 1. 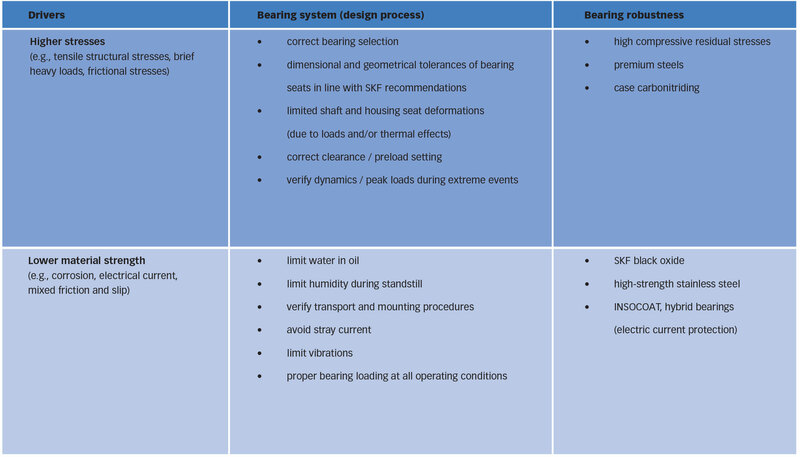 The table distinguishes between recommendations for the application itself (the bearing system, the design process) and on the possibilities to further increase the bearing robustness. Which option is the best to prevent premature failures from occurring depends on the specific application circumstances. For more advice, please contact the SKF application engineering service.